When searching for a developmental program for your player, one of the most critical components is finding an organization with a sound philosophy for developing technical and tactical skills that are age appropriate. It is also important to find a coaching staff that has the knowledge and expertise to work with the younger player. An appropriate training program that places your player in a training environment that ensures fun and proper fundamental development is also very important. Albion Juniors is under the guidance of USSF Nationally licensed Director, Oscar Cisneros. He has been a player, coach and distinguished himself as an enthusiastic and leading youth soccer coach! The ALBION JUNIORS— Two locations, Inpirada and Skye Canyon is a development Program for the Junior Player is designed to give your child the opportunity to build a solid foundation in technical development in the very early years of playing and enjoying the game of soccer. We are committed to providing a fun, educational, and progressive experience for your youth soccer players. Not only are we committed to our youth players, but we also have a wonderful comprehensive coaching education curriculum and mentorship program specifically for Albion Juniors. Come out and experience what no other club in the Las Vegas area offers! Albion Juniors the official recreational program of Albion SC, is recommended for all girls and boys, ages 3-11, who have the desire to play soccer. There are no tryouts for our ALBION JUNIORS program. Registration and the desire is all that is required. Complete uniform (every sesonal year) + one away jersey and participation awards. FREE clinics for coaches, players and referees. Admission to the league’s inaugural ceremonies..
Co-ed games for players ages 3 to 10. Teams are organized by Albion Junrios registrar. Play a full 8 games. Fundamental Skills and Development + FUN! We recommend that children to practice once a week, two maximum. This could vary depending on a teams individual coaches availability. We have Adventura Park Fields reserved for practices at the Inspirada location and Skye Canyon Park at the Skye Canyon location. Our games are located in Capriola and Skye Canyon park every Saturday between 9am-4pm for 8 weeks. Spring registration is open on October thru January with the first games and practices taking place during the first weeks of March. Fall registration is open on April thru July with our first games and practices taking place during the first weeks of September. We play a 8 week season. Overall, all players will be under the guidance and development of the Albion Juniors’ Director. He will educate, mentor, and guide the volunteer Juniors coaches who take on an Albion Juniors Team for the season. Click HERE to register. 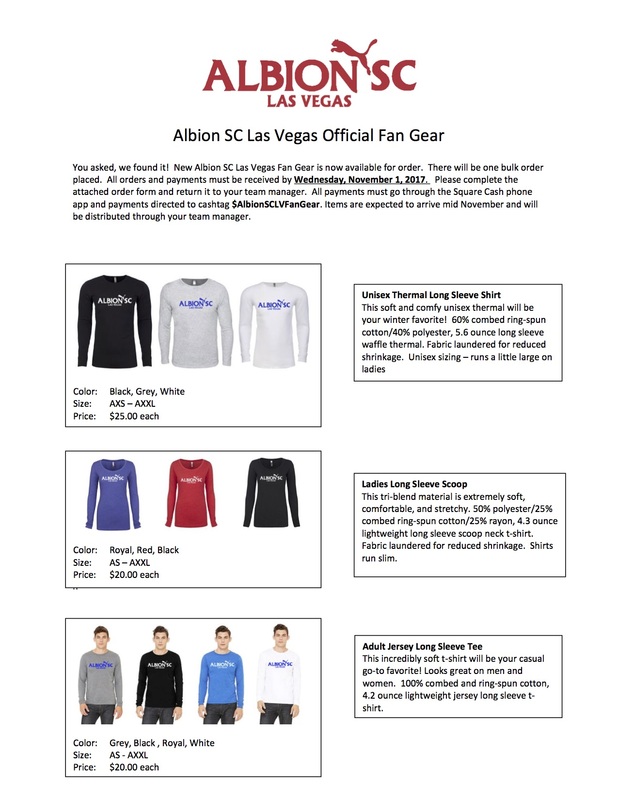 © Albion Soccer Club - Las Vegas. All rights reserved.